Since a few month I am involved in the developing of a Game called Empires and Tribes. My Job is .. hmm let’s call it “Leading 3D Artist” to remake all Models and Textures of the Game and oversee others work. Game developing from the view of a 3D Artist. Currently we are working hard on a new Demo Version. The Main change is the upgrade to the newest Unity 5 Version to be able to use new features and functionalities of the engine, shaders and Assets. My main task is the rebuilding and retexuring of all 3D Models in the Game. 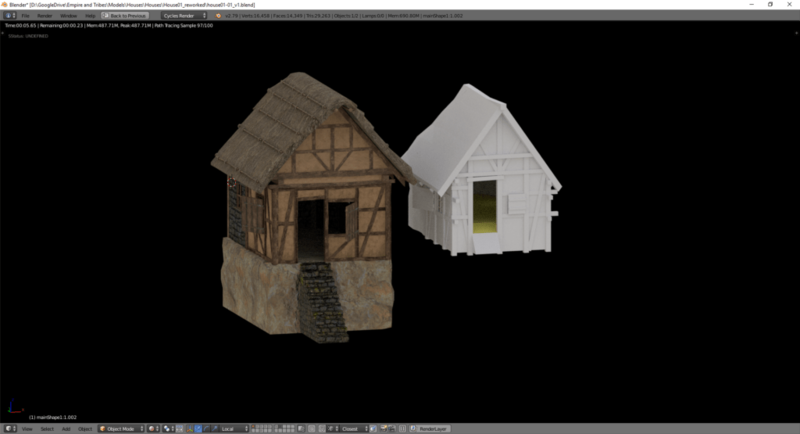 Here you can see a quick render of the a new model (left), without Specular or Roughness Data. As you can see the new Model is much more detailed. The main goal at the beginning of the remodelling is to create an Asset in Blender to do the modelling process quicker over time as the asset is growing and growing. 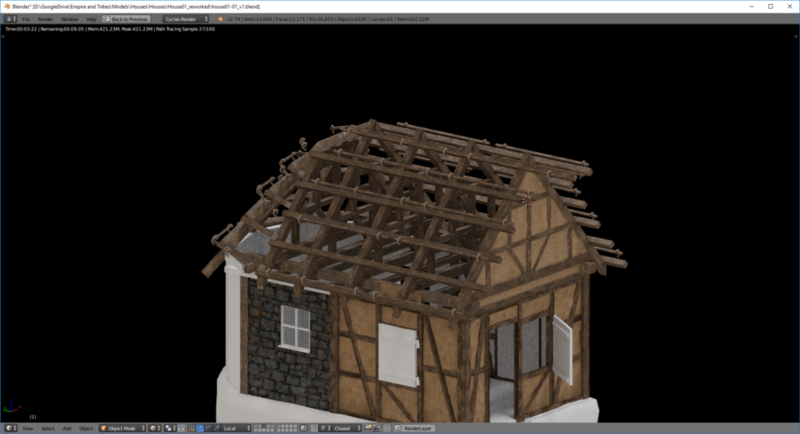 Because we have to Build over 120 Buildings, I had to create a workflow which gives us the ability to create easily new models in a real short time. Here you can see the model in the middle of the mapping process. The first model is the one, which takes the longest time. Because every error I have done during the modelling process is now showing up. Thanks to the really great Asset Management Addon it is easy peasy to manage the Asset.